The Bowmore 15yo Laimrig derived from the Gaelic word meaning pier is an annual exclusive bottling. The first release in 2009 was exclusive to Sweden and the 2014 release is exclusive to UK and The Whisky Shop. The whisky is a married maturation of ex-bourbon in American oak and a small portion of ex-sherry in European oak for 14 years. It is then finished in a purely ex-sherry cask for a further year and bottled at cask strength of 54.1% ABV. 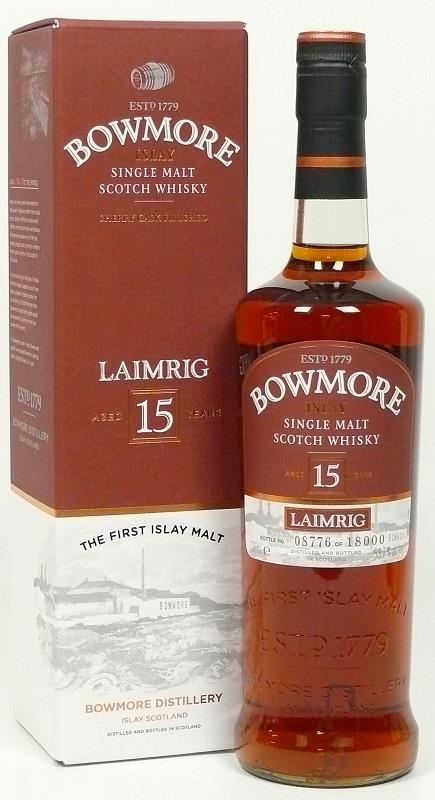 Compared to its core range cousin, the Bowmore 15yo Darkest, the Laimrig is punchier, partly from the higher alcohol content. The aroma is rich with dark honey, fruit cake, caramel, and light fruity hints of mango and apple. The palate is spicy and a little oily with dark chocolate and coffee. The finish is long, dry, and nutty with almonds and rubs the throat a little. whiskytale: The plan was a quiet afternoon on the meadow in the countryside with the sun bright on your face. Then this happened, a roaring cacophony in the skies above. High up in the clouds and you can just make out is an aircraft performing aerobatic flight. The ears cannot help but acknowledge your annoyance, but the eyes cannot gaze away the aeronautical artistry and elegance. You begin to overlook your annoyance and instead immerse in the spectacular showing. The Laimrig with the first mouthful is an attention seeker, but with a little will and peeling the layers is a pious dram to pander.